Blue-tailed Damselfly (Ischnura elegans). Male. Taken at Farmoor, Oxon on June 6th 2010. Approx 5x lifesize. Male. Taken at Farmoor, Oxon on June 6th 2010. Teneral male. Taken at Otmoor, Oxon on July 5th 2009. 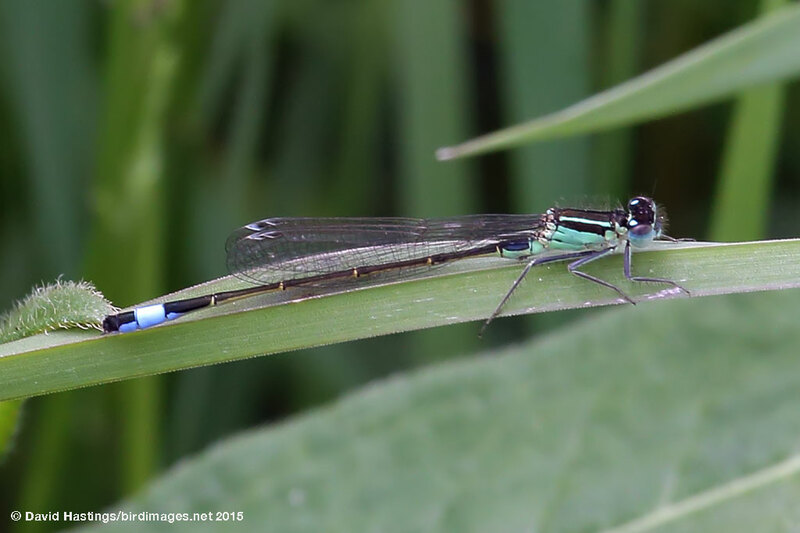 Blue-tailed Damselfly (Ischnura elegans). Teneral female (f. rufescens). Taken at Otmoor, Oxon., on June 1st 2015. Approx 5x lifesize. Teneral female (f. rufescens). Taken at Otmoor, Oxon., on June 1st 2015. Blue-tailed Damselfly (Ischnura elegans). Teneral female (f. violacaea). Taken at Hatchett Pond, Hants, on May 28th 2012. Approx 5x lifesize. Teneral female (f. violacaea). Taken at Hatchett Pond, Hants, on May 28th 2012. Blue-tailed Damselfly (Ischnura elegans). Teneral female (f. typica). Taken at Otmoor, Oxon., on June 1st 2015. Approx 5x lifesize. Teneral female (f. typica). Taken at Otmoor, Oxon., on June 1st 2015. 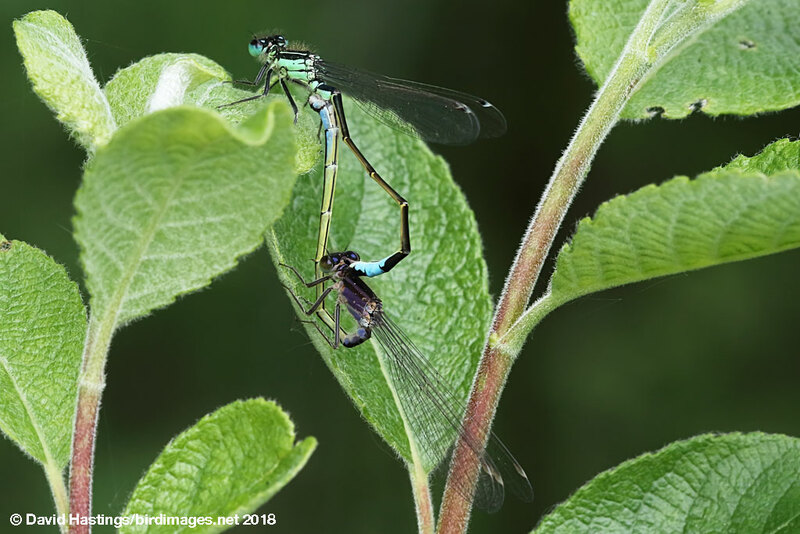 Blue-tailed Damselflies (Ischnura elegans). Mating wheel. Taken at Whelford Pools, Gloucs, on May 9th 2018. Approx 4.5x lifesize. Mating wheel. Taken at Whelford Pools, Gloucs, on May 9th 2018. 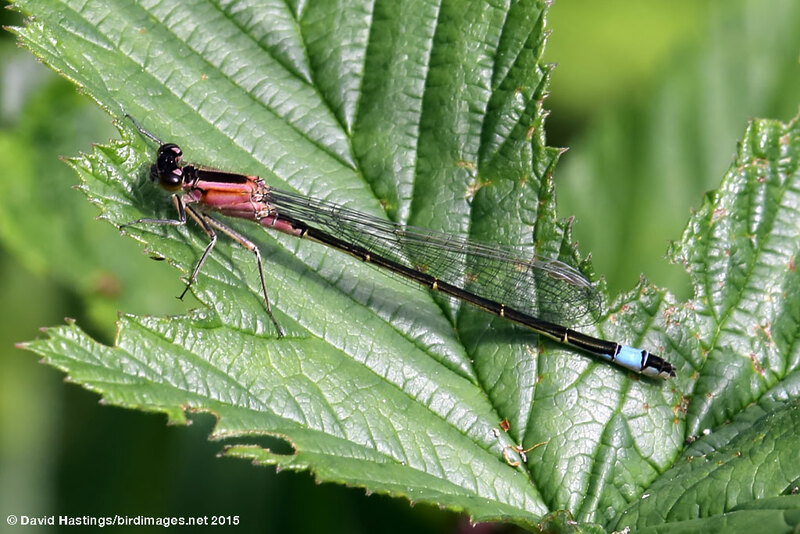 The Blue-tailed Damselfly is one of the commonest British species. Mature males always have a blue spot on S8, blue ante-humeral stripes on the thorax and blue eyes. The immature male has a greenish thorax. Females vary with at least 5 different colour forms. The thoracic markings and the tail spot are violet in the immature form "violacea", but salmon pink thorax and blue spot in the form "rufescens". When mature the female may be blue (like the male) in the form "typica", olive green thorax and brown spot in the form "infuscans", or pale brown thorax and brown spot in the form "infuscans-obseleta". This species can be found almost anywhere in the British Isles, with the exception of the Scottish Highlands. It can be found in a wide range of habitats, including brackish and polluted waters, although it avoids acidic and fast flowing waters. Eggs are laid into submerged plants and debris, without males in attendance. Adults emerge after one year on the south and two in the north. The main flight period is May to August. Males are terrotorial. Most adults remain close to water, often congregating in large numbers in bankside vegetation. Although not a strong flier, adults readily disperse to new locations.